Matter in the universe emits radiation (energy) from all parts of the electromagnetic spectrum, the range of wavelengths produced by the interaction of electricity and magnetism. The electromagnetic spectrum includes light waves, radio waves, infrared radiation, ultraviolet radiation, X rays, and gamma rays. Radio astronomy is the study of celestial objects by means of the radio waves they emit. Radio waves are the longest form of electromagnetic radiation. Some of these waves measure up to 6 miles (more than 9 kilometers) from peak to peak. Objects that appear very dim or are invisible to our eye may have very strong radio waves. Electromagnetic radiation: Radiation that transmits energy through the interaction of electricity and magnetism. Gamma rays: Short-wavelength, high-energy radiation formed either by the decay of radioactive elements or by nuclear reactions. Infrared radiation: Electromagnetic radiation of a wavelength shorter than radio waves but longer than visible light that takes the form of heat. Pulsars: Rapidly spinning, blinking neutron stars. Quasars: Extremely bright, starlike sources of radio waves that are the oldest known objects in the universe. Radio waves: Longest form of electromagnetic radiation, measuring up to 6 miles from peak to peak. Ultraviolet radiation: Electromagnetic radiation (energy) of a wavelength just shorter than the violet (shortest wavelength) end of the visible light spectrum. Wavelength: The distance between two peaks in any wave. X rays: Electromagnetic radiation of a wavelength just shorter than ultraviolet radiation but longer than gamma rays that can penetrate solids and produce an electrical charge in gases. In some respects, radio waves are an even better tool for astronomical observation than light waves. Light waves are blocked out by clouds, dust, and other materials in Earth's atmosphere. Light waves from distant objects are also invisible during daylight because light from the Sun is so bright that the less intense light waves from more distant objects cannot be seen. Radio waves, however, can be detected as easily during the day as they can at night. No one individual can be given complete credit for the development of radio astronomy. However, an important pioneer in the field was Karl Jansky, a scientist employed at the Bell Telephone Laboratories in Murray Hill, New Jersey. In the early 1930s, Jansky was working on the problem of noise sources that might interfere with the transmission of short-wave radio signals. During his research, Jansky discovered that his instruments picked up static every day at about the same time and in about the same part of the sky. It was later discovered that the source of this static was the center of the Milky Way galaxy. discovering points where strong radio signals were being emitted. He worked virtually alone until the end of World War II (1939–45), when scientists began adapting radar tracking devices for use as radio telescopes. Scientists have found that radio signals come from everywhere. 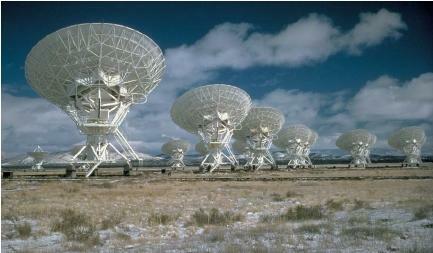 Our knowledge of nearly every object in the cosmos has been improved by the use of radio telescopes. Radio astronomy has amassed an incredible amount of information, much of it surprising and unexpected. In 1955, astrophysicists detected radio bursts coming from Jupiter. Next to the Sun, this planet is the strongest source of radio waves in the solar system. Around this time, Dutch astronomer Jan Oort used a radio telescope to map the spiral structure of the Milky Way galaxy. In 1960, several small but intense radio sources were discovered that did not fit into any previously known classification. They were called quasi-stellar radio sources. Further investigation revealed them to be quasars, the most distant and therefore the oldest celestial objects known. 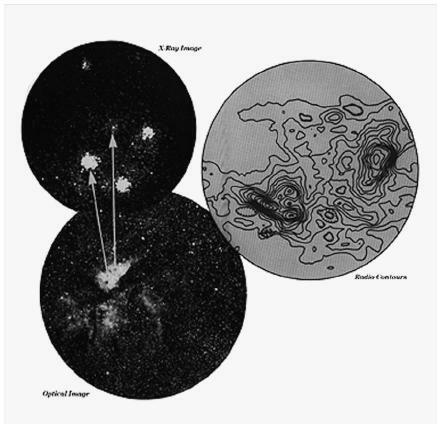 And in the late 1960s, English astronomers Antony Hewish and Jocelyn Bell Burnell detected the first pulsar (neutron star), a strong radio source in the core of the Crab Nebula. Evidence of the big bang. In 1964, radio astronomers found very compelling evidence in support of the big bang theory of how the universe began. Americans Arno Penzias and Robert Wilson discovered a constant background noise that seemed to come from every direction in the sky. Further investigation revealed this noise to be radiation (now called cosmic microwave background) that had a temperature of −465°F (−276°C). This corresponded to the predicted temperature to which radiation left over from the formation of the universe 12 to 15 billion years ago would have cooled by the present. Today astronomers use radio astronomy and other sophisticated methods including gamma ray, infrared, and X-ray astronomy to examine the cosmos. The largest single radio telescope dish presently in operation, with a diameter of 1,000 feet (305 meters), is in Arecibo, Puerto Rico.